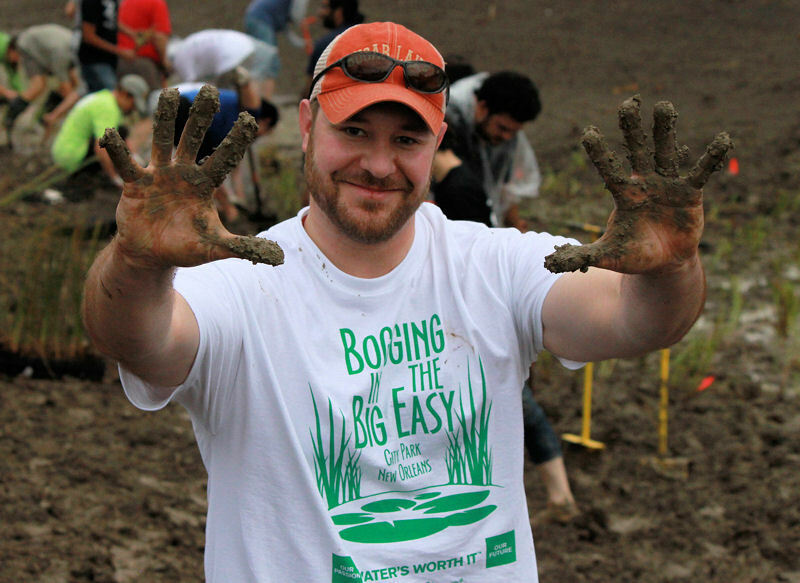 Scott Schaefer, Students and Young Professionals Committee (SYPC) member, sports a Bogging in the Big Easy shirt and muddy hands from participating in the WEFTEC 2012 service project. Photo courtesy of Haley Falconer, SYPC vice chair. On Sept. 29, approximately 80 volunteers gathered to participate in Bogging in the Big Easy, the fifth annual WEFTEC® service project. “Overall, the event was amazing,” said Haley Falconer, vice chair of the Water Environment Federation (WEF; Alexandria, Va.) Students and Young Professionals Committee. Each year, the Students and Young Professionals Committee organizes this type of event as a way to give back to WEFTEC host cities, Falconer said. A total of 80 volunteers gathered to plant a wetland area in New Orleans during the WEFTEC 2012 service project. Photo courtesy of Falconer. The bioswale is designed to remove silt and pollutants from runoff before it reaches local waterways. It is part of a larger wetland area that will provide wildlife habitat and a recreational area for park visitors. In 2005, Hurricane Katrina flooded more than 90% of the park, causing extensive damage. City Park is the largest recreational area in the New Orleans metropolitan area, and its restoration will help return recreational opportunities in the city, officials said. Photos courtesy of Haley Falconer, SYPC vice chair, and Sarah Hubbell, SYPC member.